Before buying a multimeter, you may be struggling to decide which one is suitable for your work. There are loads of things out there from different manufacturers, but one of the most important things you have to consider when buying a multimeter is multimeters brand quality, features, and pricing etc. Proper knowledge of multimeter for which you are paying for, will help you to get the proper multimeter. Here we are going to explain those things you should know before buying multimeter like its cost, which brand is suitable for you, its outer looks and its results accuracy etc. Let’s have a look over it. Which multimeter do you want? 1 Which multimeter do you want? First of all you have to decide if you want an Analog multimeter or Digital multimeter. Both devices function as great tools for measuring electrical parameters, but you have to think that which one is suitable for your work. We are just giving a basic introduction of these two multimeters will help you to select between them. (i) Analog multimeter: It is known as VOMs used for measuring voltage, current and resistance.While measuring parameters, its pointer starts moving over a scale and shows accurate measurements. (ii) Digital multimeter: It is used to measure voltage, resistance, capacitance, temperature etc depending upon its features.It basically displays results in numeric form. Note: We are using digital multimeter more as compared to analog but in some cases we prefer analog over digital like in cars the analog needle readout makes it easier to see the changing speed rapidly but if you are using digital speedometer you can’t judge acceleration as easily. If you want to buy something firstly you have to select its brand and after that you select your product. In the market, there are many different brands are available that provide high-quality digital multimeters. To find the proper multimeter within your budget, you will have to shop and compare multimeters of different brands because their prices are varying from manufacturer to manufacturer. A few examples of brands of multimeters are Fluke, Agilent, and Klein tools and Extech. These are all very reputable brands of multimeters. They provide you with high-quality products that offer you the best possible results. We recommend you to research each brand individually and their manufacturers before buying it.If you want to know top manufacturers of multimeters you may follow our previous article Top 8 multimeter manufacturers. This will help you in finding the brand value of different multimeters and their lowest price in the market. The price is the main factor you have to consider before buying any multimeter because it varies from manufacturer to manufacturer. If you want to buy fluke multimeter it would cost high than Amprobe multimeters because of its popularity. You could spend anywhere between $40.00 to $500.00 as per your requirement and your pocket. If you buy one that is not calibrated you can get it cheaper but to keep a meter within its factory accuracy limits, it must be calibrated occasionally, which costs around $50-$90 and so on. If you do not require calibrated model you can buy it at the cheapest price but once meter shows inaccuracy immediately replace it. You can buy either benchtop model or handheld model as per your requirement. It is an important factor because if you know features of any device you got a little idea about functioning and capability of that device.Always considered these things before buying any multimeter like How it display results, what it measures, its measuring speed etc. 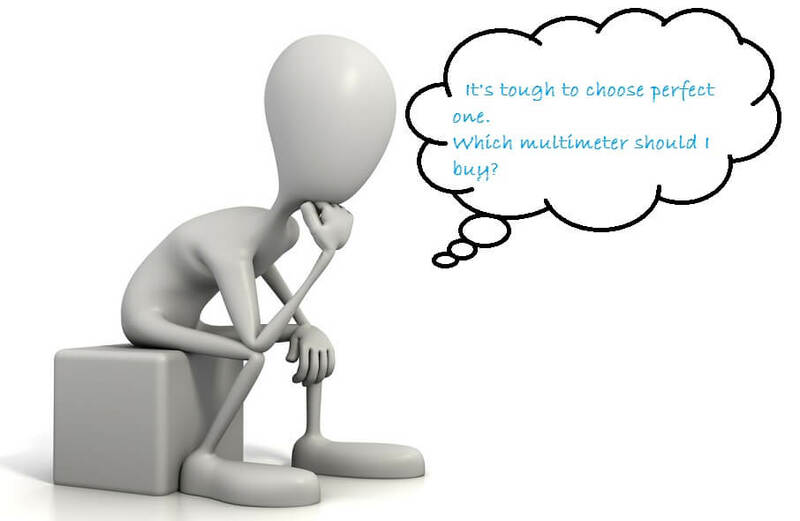 Here we are providing you some basic features of a digital multimeter which will help you in selecting it before buying. All digital multimeters have an LCD screen that will display a decimal readout and results obtain are more accurate. Some common features which you have to consider like its sample rating, dB ratings, auto ranging, Removable data storage and Data Acquisitions. Some of the digital multimeters come with additional features like measuring temperature, continuity and diode test etc you may select these multimeters as per your requirement. If you want flexibility at the time of measurement for selecting wide ranges of voltages, you have to be sure that your multimeter will have auto ranging feature or not. Because this feature helps in detecting computer malfunctions as well as wiring systems and so many more things. To find out the complete list of what all you can use your multimeter on both indoors and outdoor it is recommended to check your service manual that you receive when you buy it.